Its a rubbish photo as I didn't press the autofocus properly but I had to post it here as its a classic example of how difficult it can be to keep buses on the correct routes. A plain Plaxton Trident was working on the 83 and was just leaving town as I arrived. Personally I don't think its such an issue - as long as a bus turns up I am not too fussed on the livery / fleet name. A few months ago I would have been very happy to see this on the 15 – but as it don't come down my way its no longer relevant. Shame. I did manage a rare trip into town to get a few photos but forgot to check the battery before I left – big mistake so only managed about a dozen shots before the camera died. Busworld Photography: When did you last see an 0405? Likewise the new 'Purple 6' has seen a wide variety of vehicles on it already. Last week I saw several different un-branded B6's working it, and according to someone else at least one Dart found itself on the 6 too! Personally I think route-branded vehicles is a dumb idea (especially in this area). It confuses passengers when a bus says something on the destination board and then has massive lettering all down one side for something else. Gives the impression of disorganisation. I'm sure the money could have been spent better elsewhere on promoting services via other methods. First have always had a serious problem with this - and it isn't just the route-branded buses being off the road for maintenance or repairs. 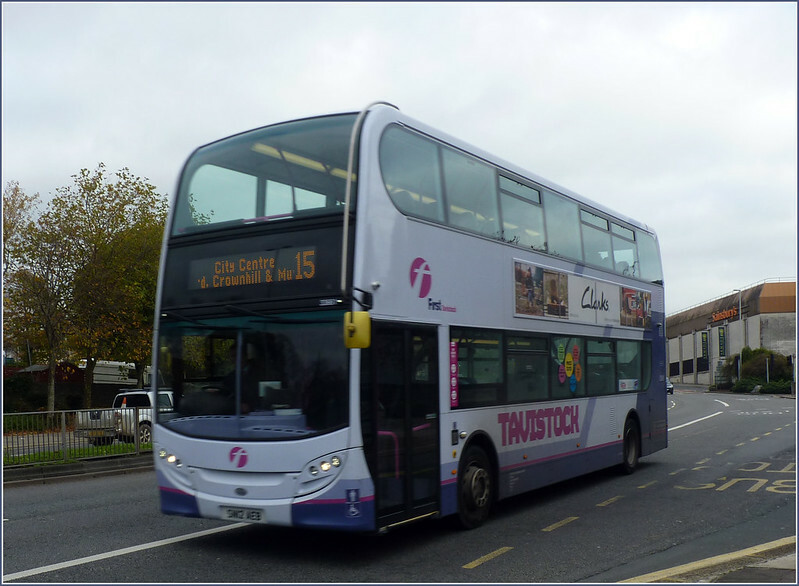 i have seen a Mayflower Link bus in Tavistock on a school contract, Ugo buses frequently in Callington, purple Tavy Linx buses everywhere except Tavistock and so on. The worst was when I saw two - or was it three - Torpoint-liveried bused in Plymouth on a private hite while the service was left to Darts and step-entrance double-deckers. I blame weak management - I always think of First in Plymouth as a company with excellent staff driving tatty-looking buses and suffering under poor management. Talking of not keeping buses on route, here is an interesting one from November 2010! Interestingly there was an article in the Hearld this week moaning about the fact first have put older buses on the route, claims the passengers are annoyed and the council are not that happy about it either. A day in the life of 40581 - Today 40581, still in plain purple has worked PR2 this morning and the a 93 showing Kingsbridge this afternoon! As others have already commented: as long as a clean, safe reliable bus turns up on time, what is the problem with the "wrong" vinyl lettering. It causes huge problems for the allocators trying to make sure that only correctly route-branded vehicles go on a particular route and servicing/breakdowns will ALWAYS throw a spanner into the works. Do you want a bus to run regardless of the lettering, or would you rather one didn't turn up simply because a branded one was not available?. Drivers should ALWAYS be clean and tidy and in correct uniform without a shadow of a doubt, but route branding on buses creates far more problems than it solves. Management as always are oblivious to this.